Cheddar Bay week 4: We [are now no longer] goin’ to Ypsi. September 18, 2013 7:20 AM / 121 Comments on Cheddar Bay week 4: We [are now no longer] goin’ to Ypsi. White smoke seen rising above the Basilica of Cheddar Bay. After an emergency session of the Cheddar Bay Executive Committee, the all-play for this week is no longer the sleeper sneaky MAC game between Ann Arbor and Detroit. Three time playoff team and undefeated 1-1 Bengals a home dog? Residual MNF football effect? Should be a strong game. Ypsilanti, MI: Home to EMU and rumored to be a pretty cool place. Welcome Swerb. I granted new player Swerb a late entry bogey of one point. There is precedent for this from past years, not a biggie, and congrats on coming out strong. Hell yes we can still accept late entries. In case you know anyone on the fence. Get em in touch with me. Cheddar public service announcement. If anyone missed yesterday’s post, Be a better bettor, it’s probably worth your while to check it out. Many thanks for Petefranklin, ClevTA, and Squeekycleen for their insights. If you know real handicappers, you know discretion and low-profile are two cornerstones in that personality profile… so we appreciate the info they were willing to share. 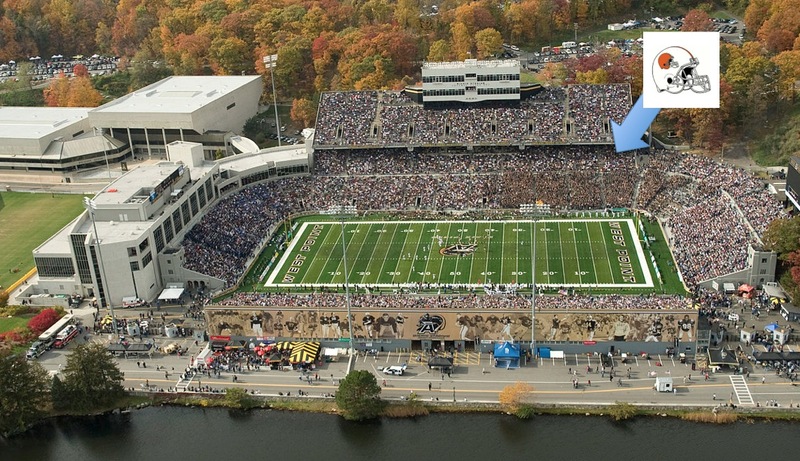 Army’s home games have been played at Michie Stadium since the 1920s. You cannot ask for a better venue. Good people, beautiful scenary, the parking –my god– the parking was executed like a miliatary operation, and Army played their balls off. Army was hanging in, down 20-13 with five minutes left in the 3rd quarter. Stanford had to out weigh Army by forty pounds at every position on the line and that eventually took its toll. But the Army TD with seventeen seconds left was hard-earned and very tasty. 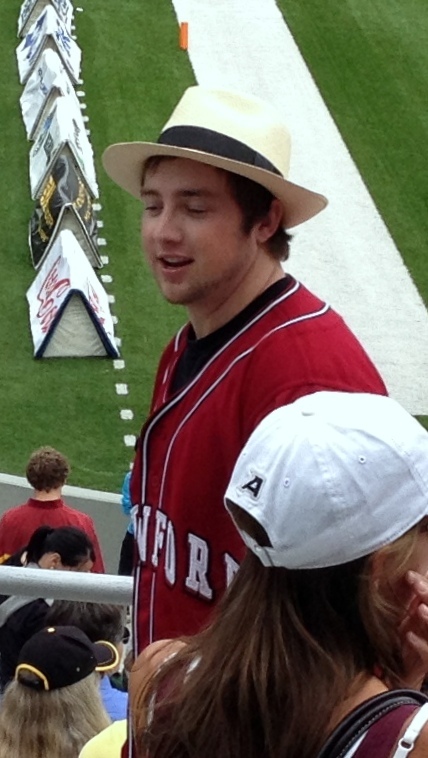 The game was a sell out with many Stanford types at the game and they all looked like this guy. The only complaint, and it’s minor, was the the Corps of Cadets were in the visitor stands. Don’t know if this is a new thing but have to say it could have been louder on our side of the field. The Corps was loud. Good thing too, because with the camo unis, you’d completely miss them but for the sound. Cheddar Bay Week 3: Browns +7 at Ravens. September 11, 2013 11:38 AM / 101 Comments on Cheddar Bay Week 3: Browns +7 at Ravens. This week’s lines are posted here. Late lines: OSU -15.5 at Cal; Ole Miss +3 at Texas. Reminder: use the “Current” column for your point spreads, not the “Open” column. Ball So Hard U will be represented Sunday. All-play is Browns -7 at Ravens. Who will have the balls to take those points this week is far and away the most interesting test of Cheddar Bayers this week. Bama/A&M would be a second. Niners/Seahawks is a great game, but I don’t think it’s nearly as compelling an All Play. You’ll get a lot of “Mangini Mangini Mangini (spoiler alert! )” and the rest surely (at least mostly) just bland rehashing of preseason punditry on one side of the Niners/Seahawks debate or the other. Your loyal commissioner is usually on top of the scoring throughout the weekend, taking time out Sunday to catch the Browns (at The Riverside Lounge in Amesbury, Mass if you’re in the neighborhood). But this weekend the scoring may lag as we’re picking off a low level bucket list item and catching an Army game at Michie Stadium, West Point, NY. The fact of Stanford playing there is incidental So look for pateslvrblk and me under the big Kanick logo as shown below. Not going to West Point expecting to witness the greatest upset in college football in the last 100 years. Dammit just noticed who’s in front of our seats and I’ve already called the Browns Stadium ushers to make the cadets sit down. Drop your picks in the comments below and happy handicapping! Cheddar Bay open thread #2; Irish at Michigan. September 4, 2013 7:09 AM / 120 Comments on Cheddar Bay open thread #2; Irish at Michigan. Welcome to Week 2 of Cheddar Bay. This week’s lines are linked here. Notre Dame +4.5 at Michigan. 8pm Saturday, Ann Arbor, ESPN. The Browns’ opener was considered for the all-play but after consultation with the Chairman Emeritus, we agreed Mich/ND is the better game and also that we were somewhat blasé going into the Browns season. Cheddar Bay open thread #1; UGA at Clemson. August 28, 2013 6:02 AM / 112 Comments on Cheddar Bay open thread #1; UGA at Clemson. Tajh Boyd’s Chik-Fil-A performance vs. Mingo/LSU was remarkable. The only reality football league where media types and Vegas sharps and a good share of the Cleveland Bar match football wits with the hoi polloi and in all in a judgment-free and supportive community is now off and running. Week one’s all-play game is Georgia -2 at Clemson (Saturday 8pm, ABC). The scoring is half points this week: the total points are four, your essay-pick is worth 1.5. Submit your picks in the thread below. August 20, 2013 3:11 PM / 72 Comments on Cheddar Bay 2013.